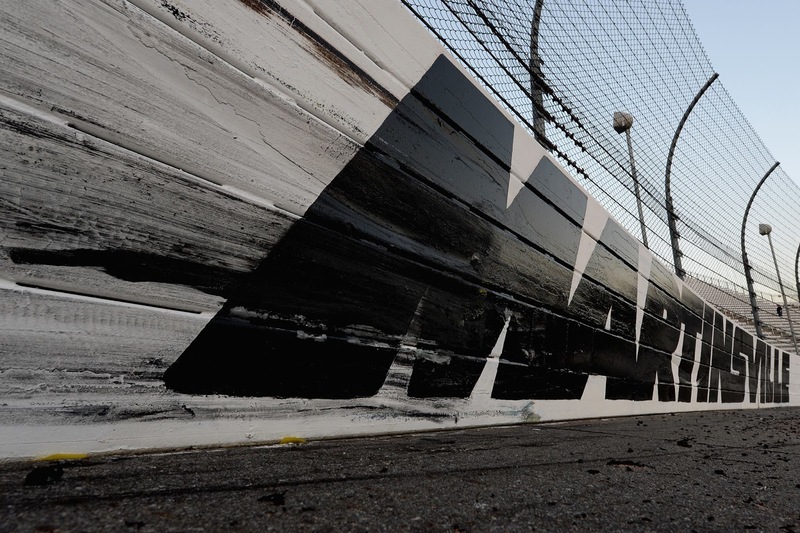 Martinsville Speedway hosted the very first NASCAR national series race in the state of Virginia on September 25, 1949. That Monster Energy NASCAR Cup Series event was won by Red Byron (Oldsmobile). Today, the Virginia Lottery Pole Day, is a big day at Martinsville Speedway. 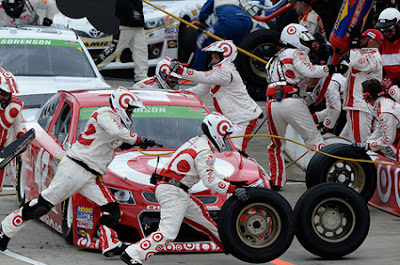 If a driver wants to miss all of the beating and banging that Martinsville brings, stay in contention, plus earn one of the top pit stalls, they need to start up front. Seven-time Monster Energy NASCAR Cup Series champion Jimmie Johnson has struggled in the first five races with only one top-10 finish – a ninth-place showing at Phoenix. Tune in and listen to @JimmieJohnson LIVE from the @MartinsvilleSwy Media Center. Luckily for the No. 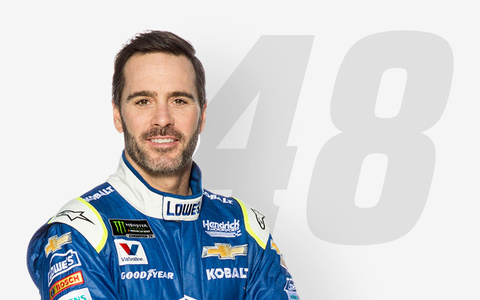 48 Hendrick Motorsports driver, he’ll get the chance to turn his season around at arguably his top track – Martinsville Speedway. Johnson leads active drivers with nine wins, 19 top fives, 24 top 10s, a 7.8 average finish and a 117.7 driver rating at "The Paperclip." He won the fall Martinsville race last year to clinch his spot in the Championship 4. 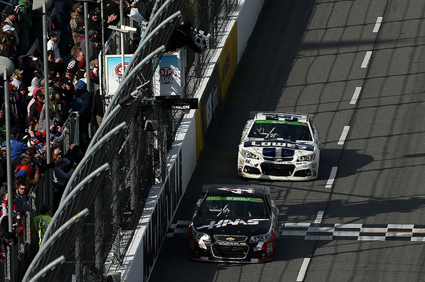 Hendrick Motorsports boasts a Martinsville track-record 24 wins. Friday Tickets are $15 for Adults; Youth 12 and under are FREE. We’re only five races into the Monster Energy NASCAR Cup Series season, but if it ended today, six drivers under the age of 27 would make the playoffs: Kyle Larson (24 years old), Chase Elliott (21), Joey Logano (26), Ryan Blaney (23), Erik Jones (20) and Trevor Bayne (26). Blaney, Jones and Bayne would all be first-time playoff participants. Jones would join Elliott (2016), Chris Buescher (2016) and Denny Hamlin (2006) as the fourth Sunoco Rookie of the Year contender to ever make the playoffs. Parity Party: 5 Different Winners Through First 5 Races: Five different drivers have won the first five Monster Energy NASCAR Cup Series races: Kurt Busch (Daytona), Brad Keselowski (Atlanta), Martin Truex Jr. (Las Vegas), Ryan Newman (Phoenix), Kyle Larson (Auto Club). H. Clay Earles built Martinsville Speedway in 1947 as a dirt track before the formation of NASCAR. 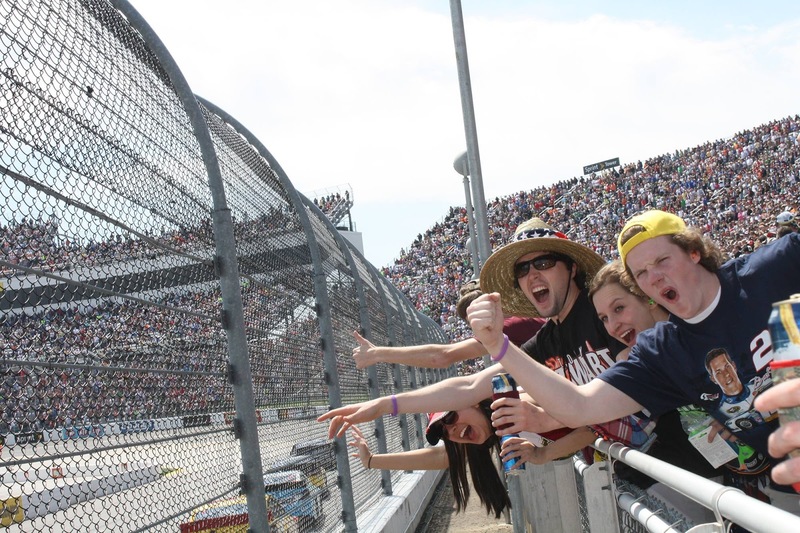 When Martinsville Speedway first opened, NASCAR was just an idea. When NASCAR was formed, Martinsville Speedway was a charter member, a membership that endures after 70 years. 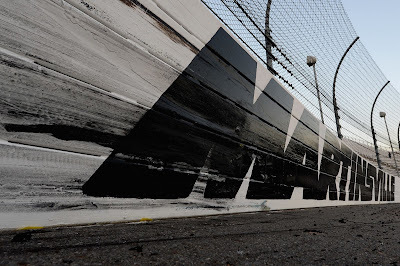 In fact, the historic Virginia half-mile oval is the only track that was on the schedule in the first Monster Energy NASCAR Cup Series season that still hosts the series today. 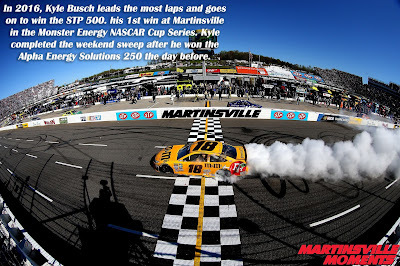 A year later NASCAR was formed and in 1949 Martinsville hosted the sixth race in the series that eventually became the Monster Energy NASCAR Cup Series. At just over a half-mile in length, Martinsville Speedway is the shortest track on the Monster Energy NASCAR Cup Series, but it’s one of the biggest when it comes to action. This weekend, NASCAR heads to Martinsville Speedway for the Monster Energy NASCAR Cup Series and the NASCAR Camping World Truck Series. Check out the full weekend schedule below. NASCAR Camping World Truck Series Alpha Energy Solutions 250; the future is now! See the next generation of NASCAR stars tackle the historic “Half-Mile of Mayhem” in the Camping World Truck Series race! Monster Energy NASCAR Cup Series STP 500; NASCAR’s best will be beating and banging in an attempt to take home the famous grandfather clock. 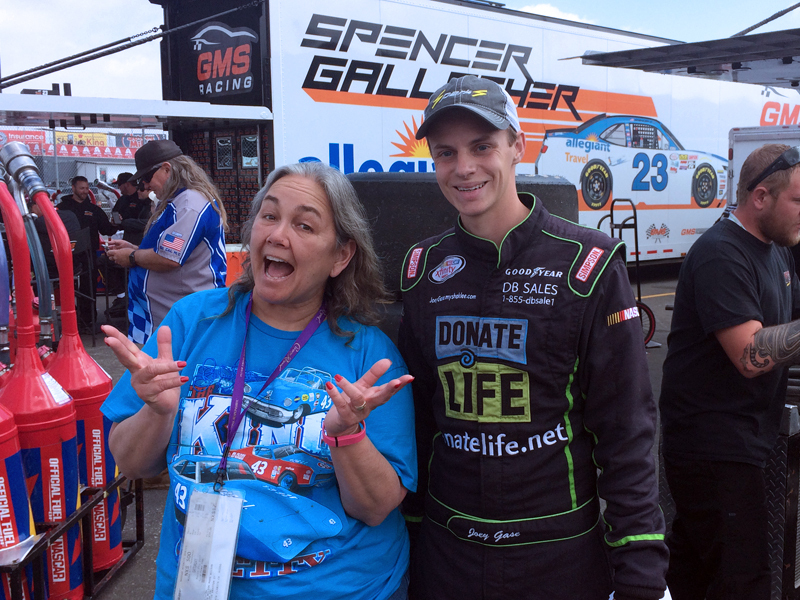 Youth 12 & Under are FREE for the #Alpha250 @benrhodes approves! Jimmie Johnson is one of the most accomplished professional athletes of his era. The only race car driver in history to be named Associated Press Male Athlete of the Year, he is a seven-time NASCAR Cup Series champion, sharing the all-time record with stock car racing icons Richard Petty and Dale Earnhardt. Johnson’s appeal goes well beyond the racetrack. He was the first athlete ever to co-host ESPN’s flagship news show, “SportsCenter,” and has been a guest on “The Tonight Show Starring Jimmy Fallon,” “The Late Show with Stephen Colbert,” “The Late, Late Show with James Corden,” “LIVE with Kelly,” “The Today Show,” “Good Morning America” and “Ellen.” He has appeared as himself numerous times in scripted series, including on Nickelodeon’s animated “Bubble Guppies.” An avid triathlete, Johnson has participated in NBC’s coverage of both the Olympics and Tour de France. In print, he has appeared on the cover of Sports Illustrated (twice), Men’s Fitness, Parade and TV Guide, among others. 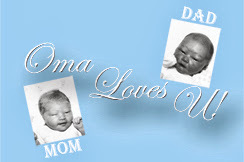 In 2006, Johnson and wife Chandra launched the Jimmie Johnson Foundation, which is dedicated to helping children, families and communities in need. It focuses on funding K-12 public education, primarily through the Jimmie Johnson Foundation/Lowe’s Toolbox for Education Champions Grant program. Grants have been awarded to 94 school projects located in California, Oklahoma and North Carolina, where the Johnsons grew up and currently reside. Grant projects include science and technology, health and fitness programs, trade-based programs, school improvements, language and literary programs, and the arts. The foundation raises funds through an annual golf tournament in San Diego and the Jimmie Johnson Foundation Wellness Challenge, a series of events held around Charlotte, North Carolina. To date, more than $8.8 million has been contributed to various organizations. 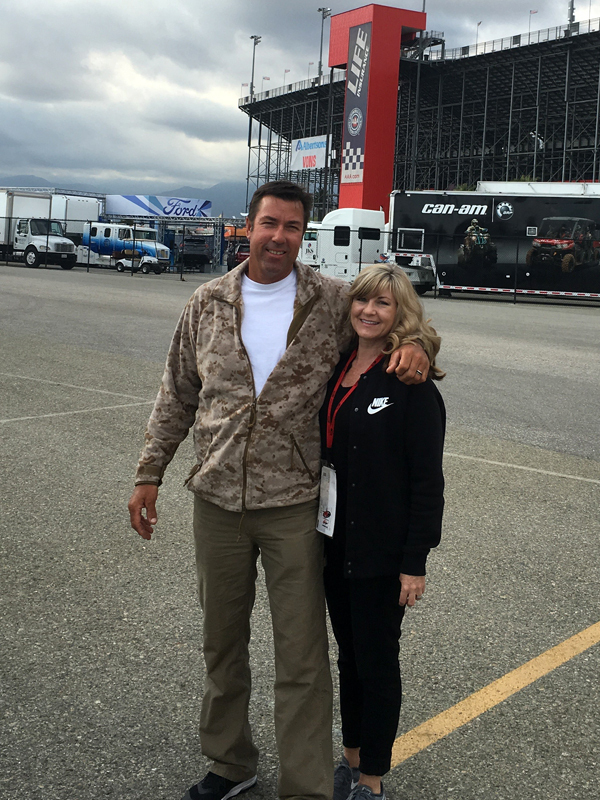 With the support of his family, Johnson’s racing career started on 50cc motorcycles at age five. Father Gary worked for a tire company while mother Cathy drove a school bus. With Jimmie and younger brothers Jarit and Jessie in tow, the family spent most weekends camping and doing what they loved – racing up and down the West Coast. Growing up in El Cajon, California, just outside San Diego, Johnson was a motorcycle prodigy. At just 8 years old, he won the 60cc class local track championship despite blowing out his knee with several races remaining and finishing the season in a cast. From motorcycles, Johnson graduated to the Mickey Thompson Entertainment Group Stadium Racing Series, where he had even more success. A 1993 meeting arranged by Johnson’s mentor, supercross champion Rick Johnson (no relation), proved fortuitous. While racing at the Los Angeles Coliseum, Rick Johnson introduced him to Herb Fishel, the executive director of General Motors Racing. The protégé lived up to his billing, impressing Fishel with driving ability and business acumen. Fishel kept his eye on Johnson that year and later helped him land with an off-road racing team. Johnson seized the opportunity, spending the next few years driving buggies and trucks in off-road stadium and desert races. 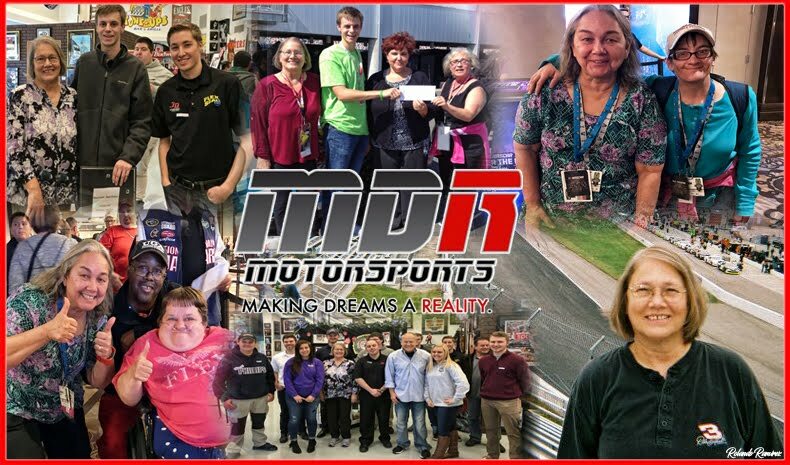 He also improved his ability to connect with fans and potential sponsors by reporting for ESPN in the Short Course Off-Road Drivers Association Series (SODA). In 1995, the work paid off in another way as Johnson met future car owners Stan and Randy Herzog while working in the series. Johnson had success in the competitive XFINITY Series, running a full schedule for the Herzog family from 1998-2001. He racked up 24 top-10 finishes and his first career NASCAR win (Chicagoland Speedway) in 2001. But midway through the season he received news that his sponsor would not return and the team would potentially fold. Concerned for his future, Johnson boldly introduced himself to legendary NASCAR champion Jeff Gordon. The conversation would change his life. Gordon explained Hendrick Motorsports was starting a fourth team, and Johnson was who they wanted to drive. In the following weeks, he had a meeting with NASCAR Hall of Fame team owner Rick Hendrick, Gordon and potential sponsor Lowe’s Home Improvement. He signed with Hendrick Motorsports in September 2000 and began his NASCAR Cup Series career with a three-race schedule in 2001. In the first race of his 2002 rookie season, Johnson, then 25, won the pole position for NASCAR’s premier event, the Daytona 500. As the full-time driver of the No. 48 Lowe’s Chevrolet, he won his first Cup race in his home state of California in just his 13th start. 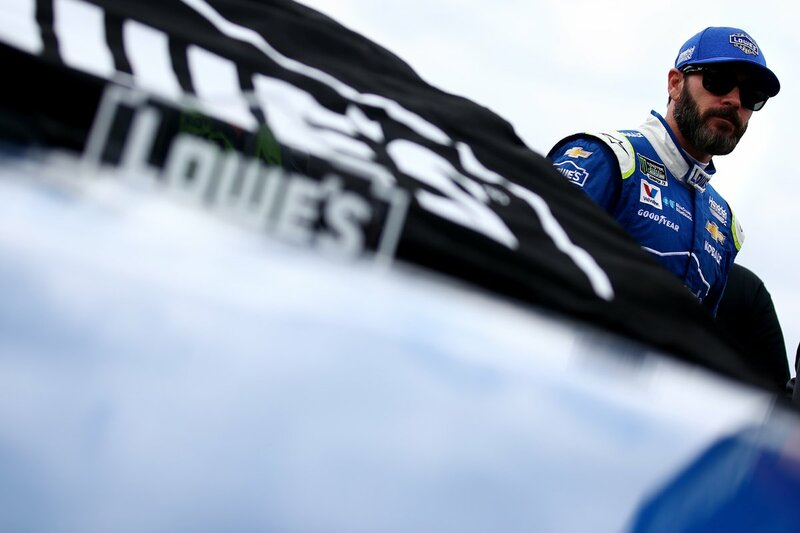 Led by crew chief Chad Knaus, he finished his banner rookie season with three victories, four pole positions and an impressive fifth-place finish in the championship standings. From 2002-2005, Johnson recorded a series-best 45 wins and an average result of 3.5 in the season-ending standings. In 2003 and 2004, he finished second in the title hunt. Johnson opened 2006 with a dominating win in the Daytona 500 and didn’t look back. The season brought great success as he won five races, including the Brickyard 400 at historic Indianapolis Motor Speedway. After knocking on the door for four years, Johnson broke through to win his first NASCAR Cup Series championship and the sixth overall for Hendrick Motorsports. At @MartinsvilleSwy, @JimmieJohnson has led 2,383 laps. That's almost 1 out of every 5 laps he's completed at the track. What followed was one of the greatest championship runs in sports history. Johnson dominated the NASCAR circuit, winning five consecutive titles from 2006-10 and becoming the only NASCAR driver to win more than three titles in a row. He is the youngest driver ever to win five championships and accomplished the feat in fewer races (327) than anyone in history. The 2013 season featured a sixth title run for Johnson, who opened the year with his second career Daytona 500 win. 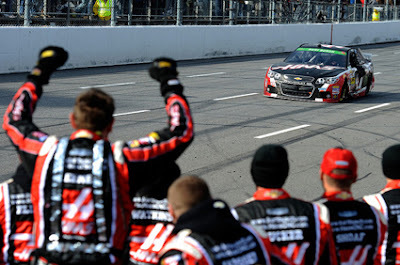 The victory marked the first for a new Chevrolet SS race car and kicked off a season in which Johnson scored six wins and led the standings for 28 of 36 weeks, including the final five. The 2014 season proved to be a challenge. NASCAR made changes to its playoff format and the team was eliminated from contention after the second round. It was the first time Johnson finished outside the top 10 in the final standings. Despite the disappointing finish and the 11th place in the standings, the No. 48 team recorded four wins including its first win at Michigan International Speedway in 23 attempts. The team rounded out the season with 11 top-five finishes and 20 top-10s. In 2015, Johnson and the No. 48 team compiled five wins, 14 top-five finishes and 22 top-10s. During NASCAR’s playoffs Johnson suffered a part failure at Dover International Speedway, locking him out of the final two rounds and ending his season in 10th place. That did not sit well with the six-time champions, so the No. 48 team set the bar high for 2016. The 2016 season was one for the record books. When Johnson won the second race of the year at Atlanta Motor Speedway, he tied Earnhardt for seventh on the all-time wins list. Three races later, he won in California for his 77th career win, and, after a 24-race winless streak, he claimed victories at Charlotte Motor Speedway and then Martinsville Speedway. 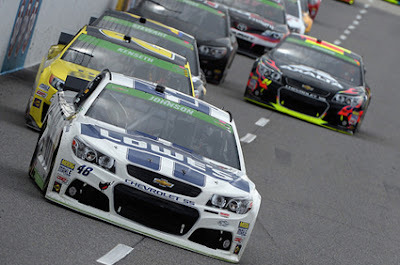 With the win at Martinsville in the third round, Johnson secured his spot in the finals at Homestead-Miami Speedway. In dramatic fashion, he started last and finished first, winning for the first time at Homestead-Miami and scoring his seventh championship – matching the record held by legends Petty and Earnhardt. Now in his 16th full season with both crew chief Knaus and full-season primary sponsor Lowe’s Home Improvement, Johnson finds himself seventh on NASCAR’s all-time wins list. He is the all-time winningest Cup driver at California Speedway (six wins), Charlotte Motor Speedway (eight wins), Dover International Speedway (10 wins), Kansas Speedway (three wins, tied with Gordon), Las Vegas Motor Speedway (four wins) and Texas Motor Speedway (six wins). 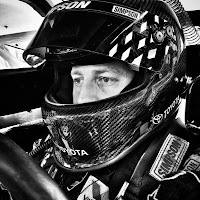 Johnson is the only driver to have qualified for the championship-deciding NASCAR Cup Series playoffs every year since its inception in 2004 and has averaged more than five wins per season throughout his career. Johnson married Chandra Janway in 2004 and is father to daughters Genevieve and Lydia. Away from the track, he focuses on his rigorous and well-documented fitness regimen. An avid cyclist, runner and swimmer, Johnson has competed in numerous half marathons and triathlons, including a Half Iron Man where he placed 15th overall. He is also an avid snow skier and enjoys spending time in Colorado and New York City. 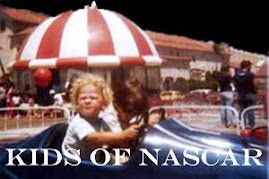 If you know NASCAR Race Mom (NRM), you know that I am a NASCAR Fanatic. Therefore it is hard for me to believe that there are actually Americans out there who do not know about the sport. 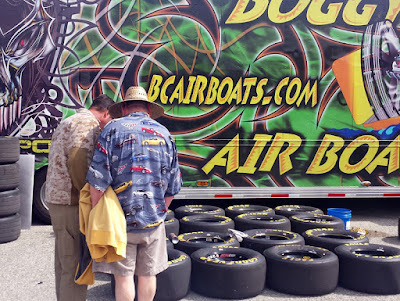 Saturday, NASCAR Race Mom was privileged for the opportunity to introduce two friends to the joys of NASCAR. First off, NRM has to tip her hat to the track itself. 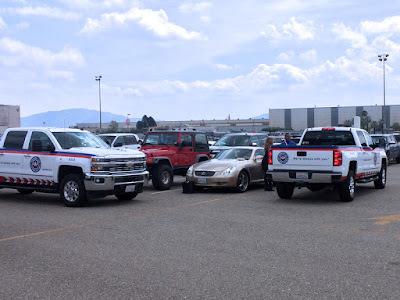 Auto Club Speedway made obtaining a VIP RV parking spot effortless. Just fill out a form and send it in. You are rewarded with a spot that is easy to maneuver into and offered plenty of room for tailgating luxury. (Thanks Dylan and Jack). Additionally, the security personal were all well-trained and extremely polite. A young lady a few row away from us locked her keys in her car. Track AAA personal were there to successfully assist her almost immediately. After a quick moment for refreshment and relaxation, our group of four headed to the Xfinity garages. As Paul and I conducted our private tour, we explained to Eric and Michelle that not everyone is able to enter the garages. Paul enlightened about all the impressive equipment and about the procedures the teams have to complete before the race. We also got an ‘up and close’ look at the NASCAR templates. I was even fortunate to run into driver Joey Gase and snap a fan photo with him. Our seats were right before the start finish line under the shade roof. Eric and Michelle were overwhelmed by the noise of the cars, especially on the restarts. Luckily a set of two dollar earplugs soothed that discomfort. From the drop of the green flag, Paul and I were busy explaining what was happening on the track and during pit stops. 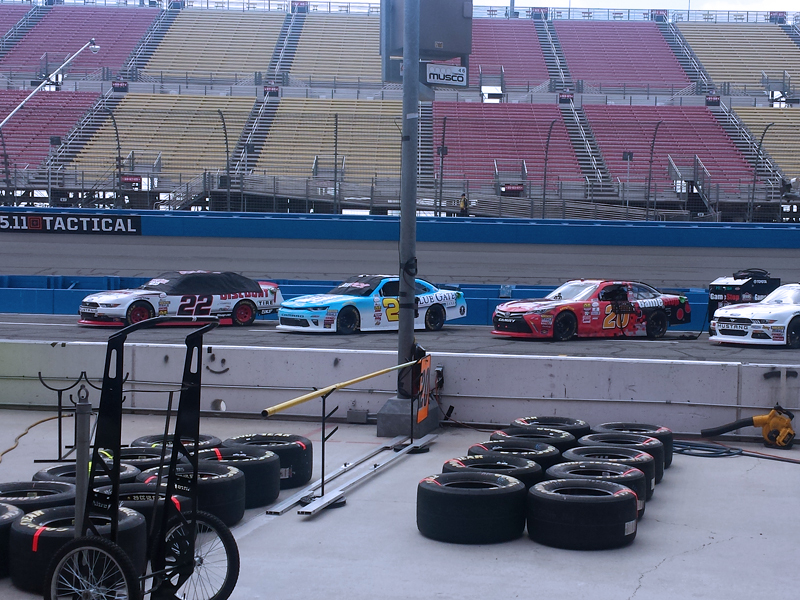 We groaned together as the #22 of Joey Logano fell off the jack, and again relegated him to the back of the pack. faster than the field, speeding penalties, pitting off sequence, stage points, making your car ‘wide’ . . . Before we knew it the race was stopped by caution with a mere ten laps to go. The perfect ending to a perfect NASCAR day. The back and forth racing between race winner Kyle Larson, Joey Logano and Kyle Busch presented plenty of battling excitement. There were also a few crashes and spins to spice up the one hundred and fifty (150) laps. Our only disappointment was Larsen’s lack of a victory burnout. 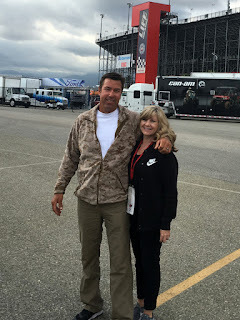 NASCAR Race Mom was at the 2014 Fontana Xfinity race when Larsen recorded his first win; the burnout, while holding his steering wheel out the window, was phenomenal. I am sorry that Eric and Michelle missed that victory celebration. 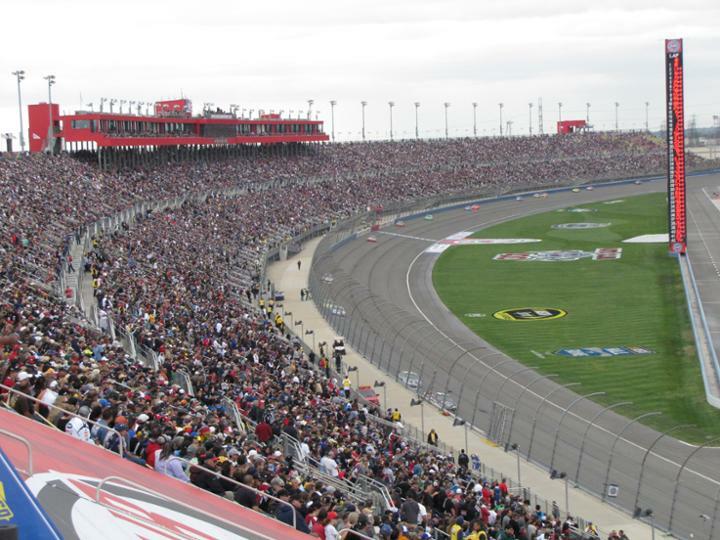 Nevertheless, the Auto Club Speedway and the Service King 300 was thoroughly entertaining. NASCAR Race Mom is of the belief that our Saturday adventure was a huge success as evidenced by a Monday morning communication. “Kyle won again in the big series.” our friends reported enthusiastically. Yup needs a bit more work, but we gave birth to two new NASCAR Fans. With the running of the ‘NAPA Auto Parts 150,’ the ‘NAPA 500 Challenge’ is half complete. 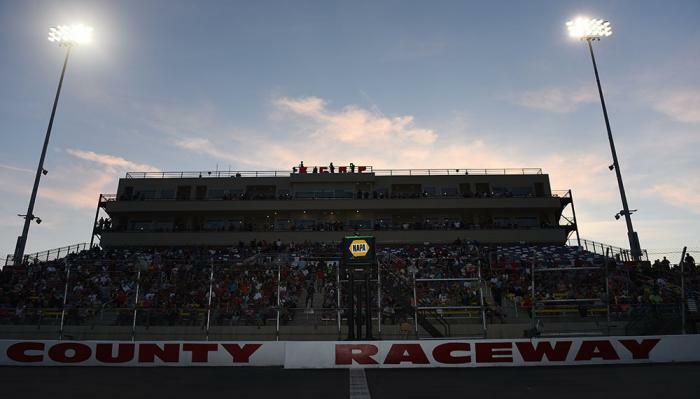 The second of four races in the challenge was held last night at the Kern County Raceway Park. The race, which included a six-lap overtime, showcased the talent of the sixteen-year-old rising star from Sherrills Ford, North Carolina. 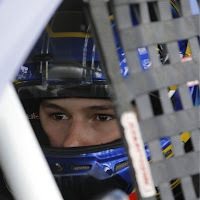 Todd Gilliland, piloted his No. 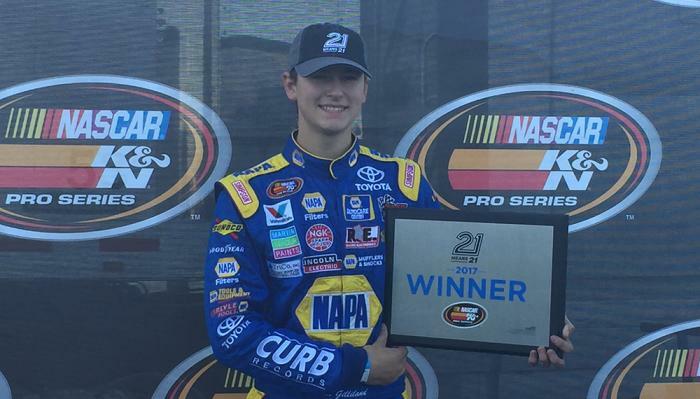 16 NAPA Auto Parts Toyota to his eighth career ‘21 Means 21 Pole Award’ and then lead seventy-two laps as he captured his eighth series victory. Drivers were required to pre-register by March 1 to be eligible for the special awards. 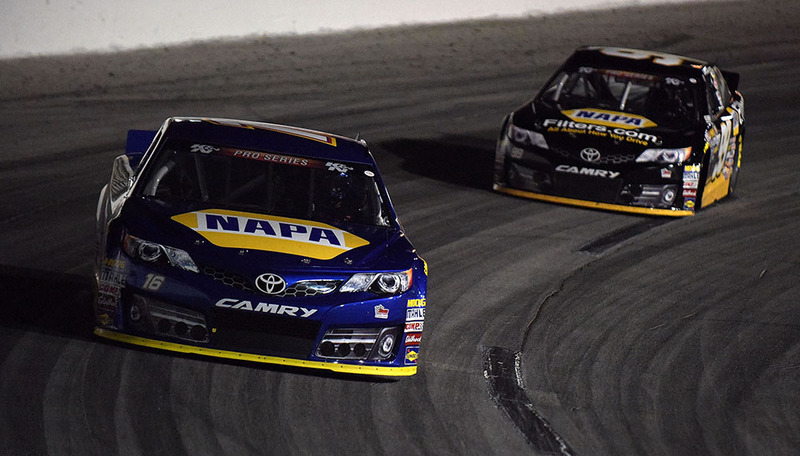 The NASCAR K&N Pro Series West will be back in action Saturday at Irwindale for the NAPA Twin 100s. Just five days after kicking off the 2017 season at Tucson Speedway, NASCAR K&N Pro Series West teams will be put to the test with three races in a three-day span to close out the NAPA 500 Challenge series. The maximum starting field is twenty-six (26) cars, including provisionals. The first twenty-two (22) cars will secure starting positions based on the group qualifying process. The remaining four spots will be awarded through the provisional process. 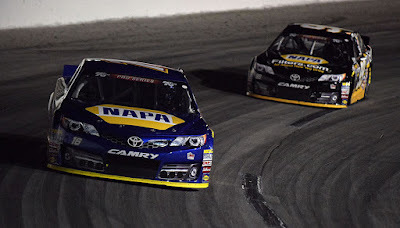 The NAPA Auto Parts 150 will be 150 laps (75 miles) with a five-minute break occurring at or near the conclusion of lap seventy-five. 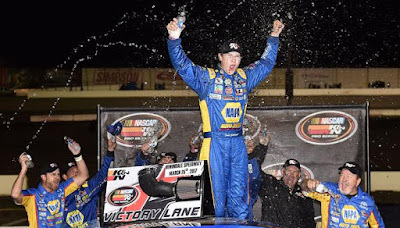 The two most recent champions in the K&N Pro Series West, Bill McAnally Racing teammates Chris Eggleston and Todd Gilliland, were the class of the field in the season-opening event at Tucson Speedway. Eggleston was fastest in practice, Gilliland won the pole and the two drivers started on the front row, led all the laps and were running first and second at the checkered flag. Teammate Derek Kraus finished sixth. As they head into the three events this week, history is also on their side. Of all active drivers in the series, only Eggleston (Kern) and Gilliland (Kern, Irwindale) have wins at either of the two tracks. Has six career K&N West wins with 20 top fives and 23 top 10s in 32 career starts. Was the 2015 series champion as a rookie for Bill McAnally Racing. Won the season opener at Tucson after leading a race-high 80 laps. Has finished fifth in each of his two career starts at Kern, where he’s never started worse than third. 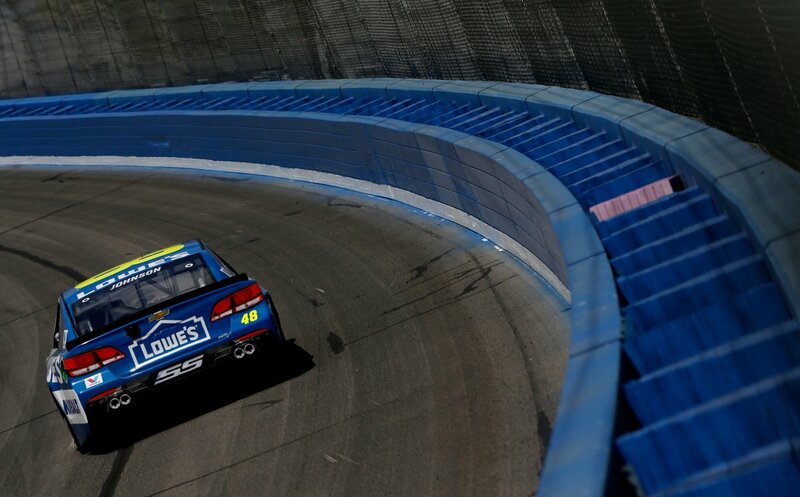 Has one career win at Irwindale in two starts, having finished third at the track last year. 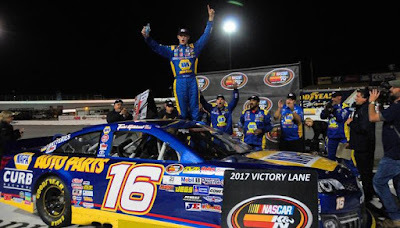 Won six of 14 races last season with 11 top fives and 13 top 10s en route to the K&N West championship, becoming the youngest champion in NASCAR touring series history at 16 years, five months, and joined his grandfather Butch Gilliland as a K&N West champion (1997). Finished second in the season opener at Tucson. Won the pole and the race last season in his only career start at Kern. Also won the pole and the race last season in his only career start at Irwindale. Plans to run both the K&N West and K&N East schedules in 2017. Driver autograph session: 6:15 p.m.
NAPA Auto Parts 150: 7:45 p.m. The series will move on to the Irwindale Speedway in Irwindale, California, for the NAPA Auto Parts Twin 100s on Saturday, March 25. Mike's Tint Shop and Detail 2 U have joined as sponsors of the #33 Chevrolet of Jeffrey Earnhardt. 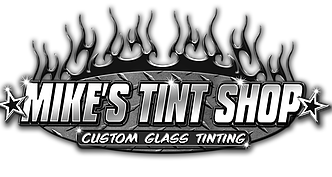 Mike's Tint Shop has been in the business of solar control since 1989. They have been in almost every magazine for their custom tint graphics. Their services include window film for commercial, residential, autos, boats, and RVs. 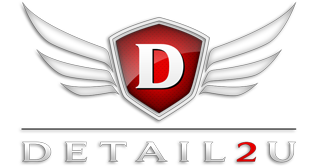 Detail 2 U uses the latest technology to recondition, restore, and protect your car's exterior and interior. They will always give your vehicle the treatment and protection it deserves and make sure your vehicles look great for years to come. K1 Speed Karting will be joining Jeffrey Earnhardt for this weekend’s Monster Energy NASCAR Cup Series race. Founded in 2003, K1 Speed is the Premier Karting Company in America. Offering highly-advanced and environmentally-friendly electric karts as well as large indoor entertainment venues that feature authentic racing memorabilia, pit cafes, meeting rooms and pool tables, K1 Speed is a great place to visit with family and friends or to host a corporate event or party. “We are very excited to be working with Jeffrey again at Auto Club Speedway. Southern California is where K1 Speed was established and it’s where the company’s national headquarters is located. So, this weekend is a home track race for all of us. Working with Jeffrey, Mr. Falk, and the entire race team has been an absolute pleasure, and we look forward to seeing the No. 33 Chevrolet take to the track on Sunday,” said Randall Hoppe, Advertising and Band Marketing Manager at K1 Speed. 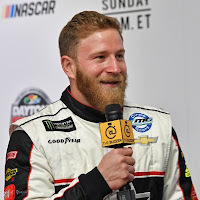 Jeffrey Earnhardt is the grandson of Seven-Time NASCAR Cup Champion Dale Earnhardt and nephew of this generation’s most popular driver, Dale Jr. He began his race career piloting a silver 4 cylinder Yugo on the dirt tracks of Wythe Raceway in Rural Retreat, Virginia. This weekend will be Earnhardt’s second start at Auto Club Speedway in the Monster Energy NASCAR Cup Series. His first was in 2016 with Go Fas Racing. He started thirty-ninth (39) and finished thirty-fourth (34).